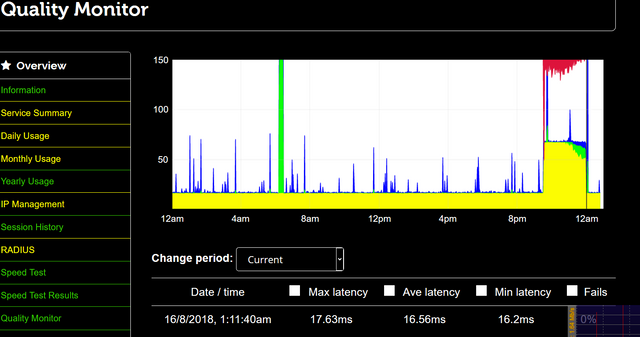 TTB are upgrading their routers tomorrow in a 5 hour slot usually starting at 12am affecting many exchanges so anyone on TTB lines may see outages tomorrow. What do you understand 12am to mean? Using the 24 hour clock, I would understand that to be 0000 hours. At the time of this post, that is 36 minutes from now. My bad this may just affect Uno but as there is a list of a lot of exchanges I would think it affects other ISPs. Work is due to start Thursday 16 August at 1am or 0100 not 0000. This is shown as Edge Device software upgrade at Sheffield on Johnson's link. Ah, yes, I see the entries. None of which cover standard FTTC connections, unless Talktalk are just choosing to be ridiculously selective on how they quote affected services. Well I didn't notice any outages during the window. As j0hn pointed out, "Ethernet, EoFTTC & EFM" has no relevance to consumer FTTC services. And as if by magic tonight, high latency, packet loss and low throughput on my TTB line. Emailed Uno and got a reply straight away saying looks like a broken fibre. It would be interesting to know where that broken fibre is located . . . if Uno are themselves are told. According to my tests this has been sorted, although it is still on the Uno status page as an outage. Could be that Uno has re-routed traffic around the broken cable. Apparently it was emergency cable work but TTB didn't give any notice. Ah, I see. Thank you for asking and for your update. I'm sure that Uno would have re-routed any traffic as soon as they became aware of the problem. According to Uno's quality monitor it appears to have been fixed/re-routed around 12am. Been monitoring that TTB Network Status page linked to by Johnson and I think it is not that useful. Too many planned operations, no open incidents. Bit of a minefield.